God's word brought to you in clarity using words that stunningly convey the original meaning and significance intended. Over 22 years in the making. Carefully translated from the Greek Textus Receptus. Highly comprehensible, self interpreting, with hundreds of motivating, insightful notes. Never before published insights into Bible prophecy, end times, antichrists. What makes The Last Days Bible unique? The Prophetic Scriptures seriously considered, understandably analyzed, and cross-referenced. The book of Revelation carefully explained, so you can finally comprehend it. Many hundreds of never-before-published informative, authoritative footnotes for the last generation. Has anyone ever told you what the approximate sequence of events will be in the Last Days of this age, as revealed in the Bible? Well, here you have it! Find the answers to these and countless other questions in this remarkable new version. The Last Days New Testament is an accurate NEW translation that vividly brings out the truth in the expressive language we use every day. 22 years in the making, including eight years of prophecy study, with the Old Testament to follow, Life Messengers is still committed to bringing the message of God's love through Jesus Christ in as understandable and powerful a way as possible. The producer and publisher of this version of the Bible is Life Messengers, the organization founded in 1944, that produced and published in great quantities such outstanding witnessing booklets as Here's How ~~ Destined for Greatness ~~Have You Been Brainwashed? ~~ and many others. Over 66 million copies of Here's How alone were printed and distributed in over 50 languages in scores of nations. How can I know this is an accurate translation? The actual translation work for this New Testament was accomplished over a period of many years. Twelve Greek scholars have given critical guidance in the forming of it. Skilled and anointed theologians have reviewed the notes, and English purists have been employed to polish the style and grammar. Most of the Greek scholars, representing various denominations, teach, or have taught, New Testament Greek in a Christian university, seminary or Bible school..
Who is the general editor and main translator of this version? 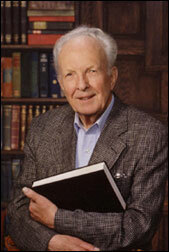 Ray W. Johnson, a graduate of Moody Bible Institute, took an intensive course in Greek as a student under Kenneth Wuest. Upon graduation in 1941 Mr. Johnson married and pastored a church, but felt called to develop a worldwide Christian evangelistic publishing ministry. This was accomplished through the founding of Life Messengers in 1944 in Seattle,Washington, USA. The publishing ministry soon became his full-time occupation but not before painting houses for a few years to supplement the meager income from his literature ministry. The real breakthrough came in his life after stirring himself up to diligently seek God's blessing in a regiment of daily prayer. What Greek text was used as the basis for this translation? The Textus Receptus, commonly called the Received Text, was used because this was the text accepted by Greek scholars hundreds of years ago as the correct text. It's the text from which the King James translation was made! The overwhelming majority of the approximately 5,000 complete and partial ancient Greek manuscripts of the New Testament agree with the Received Text.